But the spiders are not here. In particular, we’re in search of Darwin’s bark spiders—a gobstoppingly creative animal that only lives here, in the montane rainforests of eastern Madagascar. Or, more precisely, lives over water in these forests. In 2001, Agnarsson—a native of Iceland and now a professor of biology at UVM—and Kuntner, his Slovenian friend, now the director of the National Institute of Biology in Slovenia, were graduate students at George Washington University. They were making a trek across Madagascar to hunt for social spiders—when they noticed some enormous, orb-shaped webs stretching across a river near where we now stand. They’d never heard of spiders that live over rivers, and they were impressed with the long silk lines stretching between trees on either bank. How did a spider the size of a quarter cast a strand of silk as long as a blue whale? They waded into the water, collected some of the black spiders and their webs, and went back to school. It turns out they had discovered a new species, unknown to science. But it wasn’t until 2010, after another trip to Madagascar, that they published their results. They gave the spiders the scientific name Caerostris darwini on November 24, 2009, in honor of the naturalist Charles Darwin—exactly 150 years after the publication of On The Origin of Species. Their research shows that Darwin’s bark spiders are unique in their ability to make webs over rivers (and even small lakes), and that they build the biggest webs in the world, suspended below a hair-thin dragline cable that can extend more than eighty feet. 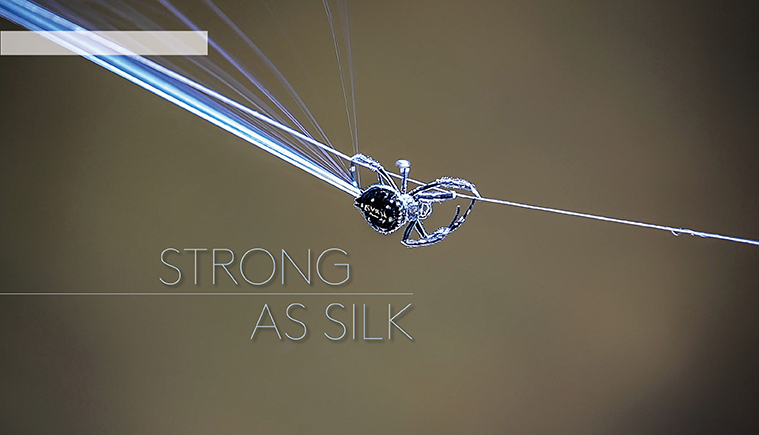 Lab measurements also revealed that this silk is the toughest organic material in nature—an exquisitely tuned combination of strength and stretchiness—requiring much more energy to break than high-tensile steel, ten times tougher than the Kevlar fiber used to make bullet-proof vests, twice as tough as any other known spider silk. In just a few million years, in what Darwin called the “frequently recurring struggle for existence,” these animals have evolved a stunning biotechnology that lets them hunt where no other spider can—the insect flyway above a river—using their webs, like fishing nets of the air, to absorb the impact of dragonflies and beetles bombing over the water, stopping, snaring, and sticking them with several types of silk. Madagascar split from India about 88 million years ago. Now an astonishing ninety percent of its plants and wildlife are endemic—they live only on this island—including Darwin’s bark spiders. 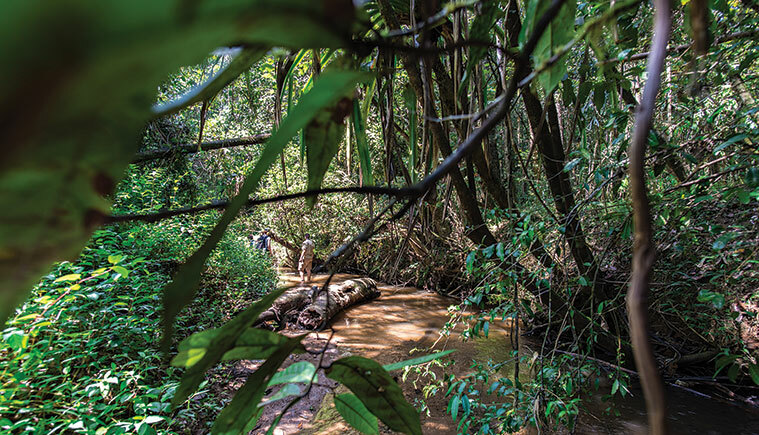 Scientists search for their webs over a stream in Andasibe-Mantadia National Park. This is the first day of field work at the beginning of a two-week expedition that Agnarsson is leading to collect Darwin’s bark spiders and five closely related species, to sample their webs, and collect their silk. He and two other co-investigators back in the United States have secured more than $900,000 in grant funding from the National Science Foundation—and several permits from the government of Madagascar—to gather and study what they hope will be hundreds of spider and silk samples. They know that millions of Darwin’s bark spiders live in these forests, but on this December afternoon they seem as elusive as Sasquatch. What is their super-silk made of? How do the spiders produce it? How did it evolve? To try to better understand these questions, the team has spent nearly three days traveling here, flying from Vermont, Philadelphia, and Slovenia, over the Sahara Desert, down the coast of East Africa and four hundred miles out into the Indian Ocean to Madagascar, the fourth largest island in the world. In the middle of the night, Paul Babb, a genetics expert from the University of Pennsylvania, and I landed at Ivato International Airport and traveled into the unlit, cobbled streets of the capital city, Antananarivo. Eight-year-old children knocked on the windows of our van at 1 a.m. asking for money. Young men changed tires holding flashlights between their teeth. In the morning, we joined the rest of the team and drove east in a scrum of bicycle rickshaws and wagons pulled by zebu-oxen mixing with Citroen taxis and sleek double-tank oil trucks. Barefoot workmen, pulling hand carts stacked high with office chairs, jostled with teenagers in crisp white shirts and black ties walking to school. We passed tiny market stalls piled with luscious-smelling pineapples. Down alleys, merchants under umbrellas sold bread, Coke, worn pants, cell phones. Heading out of the city, boulders were draped with bright sheets as people washed their clothes at river’s edge. Old women filled bags with charcoal. We drove for three hours, our driver gunning and zig-zagging over a rutted highway, while electric-green rice paddies gave way to tan mud-and-wood houses and scrub-covered hills with scorched patches burned to prepare for crops. “Imagine this was all forest for thousands of years,” said Matjaž Gregoric—another Slovenian spider expert and Matjaž Kuntner’s former grad student who the older scientists simply call Junior. He swept his hand across a pitted valley of raw red soil. But in the afternoon we began to see more trees. “We’re about to enter primary forest,” Agnarsson said. “Most of it is gone,”—and it’s in these remaining pockets that much of Madagascar’s wildlife persists—critically endangered lemurs, golden mantilla frogs, nose-horned chameleons, the cat-like carnivorous fossa, streaked tenrecs covered with yellow spines, and thousands of others—including Darwin’s bark spiders. Agnarsson, Kuntner, and Gregoric have each made several trips here over the years to study these spiders. But never at the beginning of Madagascar’s summer, awaiting the arrival of the rainy season as we are on this first day of fieldwork. The scientists start talking about how the stream looks drier than they have seen it and that there might not be as many aquatic insects as other times of year to support adult spiders. “Everything will be fine,” says Gregoric. “It’s just a moramora start,” he says, invoking a local expression that literally means “slow,” but could be translated as “things will happen when they happen.” Onja Raberahona smiles broadly and repeats “moramora” with an authentic Malagasy accent. At twenty-eight, he’s the youngest member of the expedition, and, for now, the only native Malagasy. He’s recently completed his master’s degree in entomology at the University of Antantanarivo. His English is more spirited than advanced, but he and Ingi have already started chatting about how they might arrange for him to come to Vermont to start a doctorate. “Yes, we like spider,” says Raberahona. Tear-shaped leaves the size of canoes and a riotous geometry of vines, bamboo, and palm hang over a stream, making a dappled green canyon. “Let’s try this one,” says Agnarsson. He and our keen-eyed park guide Hononé Rabarison—who everyone calls Nono and who joined the team a few days ago — slide down a steep embankment covered with ferns. The scientists have been hunting spiders for three days and into the night with headlamps. They now have data—including sightings of ogre-faced Deinopis spiders that cast their webs like snares with their front legs; bags of Gastrocanthus spiders they spotted in bushes by the side of a jeep road exhibiting a brand-new-to-science form of colonial web building (“Never seen anything remotely like it,” Agnarsson said); collections of dozens of adult and juvenile relatives of the Darwin’s bark spider. But, still, very few Darwin’s bark spiders themselves. “The lack of darwini is amazing,” Kuntner had said in a stream yesterday, where in previous years they had seen them round every corner. “Stunning,” Agnarsson said. “Never in the history of arachnology have the males of these species been seen before,” Agnarsson told me last night over our second bottle of Three Horses, the local brew. Spirits were running high much of the day. “It’s possible it’s a new species. Anything is possible in a place like this,” Kuntner had said. “And how will you know if it’s a new species?” I asked. “We’ll start with the microscope,” Agnarsson said. But more definitive proof will have to wait until they can get their samples back to the United States for genetic analysis. “Ingi likes to say, ‘luckily, God invented DNA,’” explained Gregoric. “Adam was clueless,” Agnarsson said. This afternoon, the group is dragging. Gregoric stands in the stream, cutting single strands of silk out of a large web. He snips them with a hot soldering iron and attaches the ends of each strand with superglue over a window in a cardboard microscope slide. Snip after snip, slide after slide, web after web: repeat hundreds of times over two weeks. David Attenborough and Wild Kratts would be off the air if they showed how ploddingly repetitive so much field science really is. “Junior, how many darwini have we caught?” Agnarsson asks. “Three or four adults,” Gregoric says. “That’s it?” Agnarsson says. To successfully complete their experiments, they’ll need at least ten webs from each of the Caerostris species, and a lot more adult female Darwin’s bark spiders than they have now. The scientists’ field laboratory is also Matjaž Kuntner’s bedroom. The small cabin, in a row of identical cabins, is thatched with palm leaves and held up with bamboo poles. The door and open-air window look out onto a tidy cobbled path, gorgeous pink flowers, and the breathing rainforest. Inside, Agnarsson looks down through a small Nikon microscope. Gregoric adjusts a whining Black & Decker electric drill that winds round and round, drawing meter after meter of silk out of a spider in a plastic bag on the table. There are piles and rows of spiders everywhere, some preserved in ethanol, some living in vials. Kuntner and Babb sit on the bed, entering data into laptops. 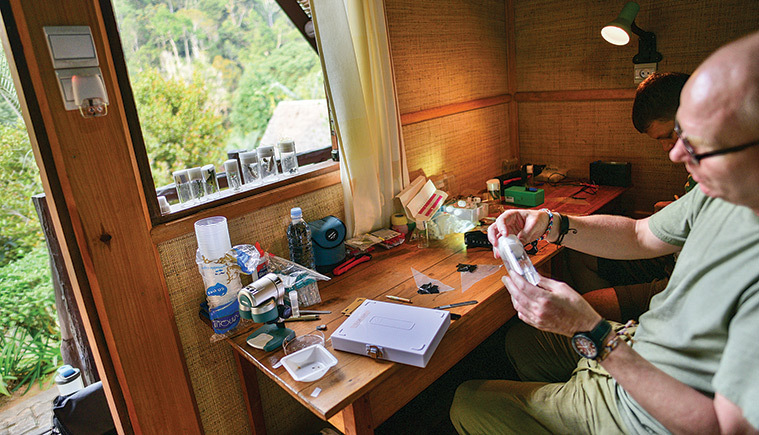 “The biggest deal of this trip is to get the specimens back home, to the lab. To guarantee the success of the project, we need to get the proper genomic and genetic and RNA data from these specimens,” he says, opening his hands over the room full of arachnids. The scientists hypothesize that at some point in its recent history—“certainly less than ten million years,” says Kuntner—the Darwin’s bark spider evolved a novel gene in its DNA. And that this bit of code shapes a unique protein—known by the poetic name MaSp3—and that this protein is the secret sauce in the spider’s super-silk, combining both “stiffening crystalline regions with highly extensible amorphous regions,” they write. In other words, it’s strong and stretchy together. But an end-product view of this silk as simply a material misses a deeper physiological and evolutionary story. It’s long been known that spiders make a variety of silks for various needs—like capturing prey, building cocoons, wrapping food. Darwin’s bark spiders have seven different glands, six for silk and one for glue. But only one—the major ampullate gland—produces the super-silk that they use for their main cables and lifelines. When dissecting spiders collected on earlier trips here, scientists were intrigued to discover within this gland a strange loop and long nozzle-like duct, unlike any they had seen in other spiders. They believe that the evolution of this loop-and-duct system was crucial to the evolution of super-silk. That’s because the shape of the long duct lets the animal apply shear forces to the nanocrystals forming in the MaSp3 proteins—while they’re still in a liquidy dope inside the spider—lining them up just before they come streaming out. In other words, its not just the chemical composition that matters—it’s the biomechanical action of the living spider that allows the world’s toughest fiber to form, and get carried over the water in the wind. It’s midday and we’re waiting for Onja Raberahona and Nono Rabarison to return from another effort to find more Darwin’s bark spiders. The team has collected plenty of juveniles, but the scientists think that at this time of year there are low numbers of adults—and that we haven’t looked in the right spots yet. Nono spotted some webs over a larger river farther east yesterday, so they’ve gone to look, while the rest of the team has a day in the lab. One of the occupational hazards of being an entomologist is having to counter the narrative that collecting insects and spiders endangers their populations. If we need to protect every lemur, why not the spiders too? “It’s just a different scale and most people don’t understand it,” Kuntner says. “I estimated 600 eggs in one egg sack,” says Gregoric. “We’ve collected 150 spiders so far,” Agnarsson says—and every acre of forest can sustain thousands of spiders and provide a home for millions of invertebrates, from butterflies to beetles. “In order to develop conservation plans you have to know what’s living there and how it lives,” says Kuntner. 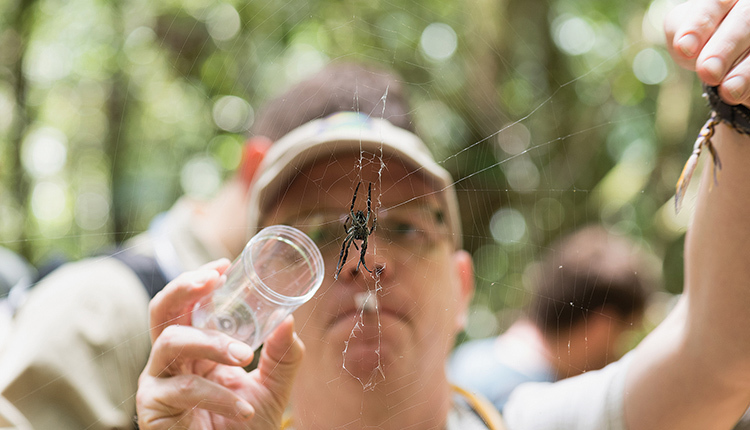 If Agnarsson can bring a tiny fraction of these spiders back to his lab to test, to use to train his students, to deposit in UVM’s Vermont Natural History Museum, where he’s the curator of invertebrates, and in the Smithsonian Museum where he is a research associate, he believes he’s building the scientific foundation for conservation. Just a few years ago, scientists didn’t know about the Darwin’s bark spider. Now Agnarsson and the other researchers think they may yield profound insights into the evolution of silk and radical design principles for a new generation of biologically inspired fibers, from better sutures for surgeons to safer armor for police officers. “How many are there?” I ask. “A golly-load,” says Gregoric, eyeing my voice recorder.